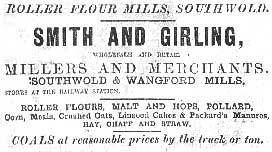 C R Smith and H W Girling - trading as 'Smith & Girling', have commissioned this impressive factory building which was constructed by Wangford builder, Mr Chilver, equipped by Whitmore & Binyon of Wickham Market and is opened on the first of January this year by the Countess of Stradbroke. 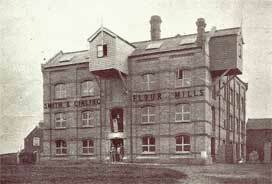 The mill is a modern steam-powered roller mill, the first such in the town. Southwold's three wind-powered mills have by now all been demolished or have burned down. Its products include, in addition to flour, malts, hops, pollards (animal feed), linseed cake and manure. Smith & Girling have other branches in Wangford, Walberswick and Halesworth and have their own cargo boats to carry coal for their own steam boilers and for sale. 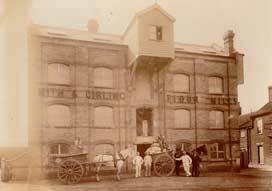 A pioneer of 'health and safety' in an industry traditionally vulnerable to fire, Smith & Girling have divided their mill into three sealable compartments, linked by fireproof iron doors. 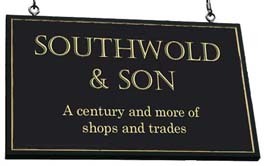 To read a contemporary description of the facility in the 1903 publication 'Southwold & Neighbourhood', click here. H W Girling dies this year and the business closes in 1918. F L Pallant - Managing Director of Fordux Manufacturing Co, wholesale bedding manufacturers. 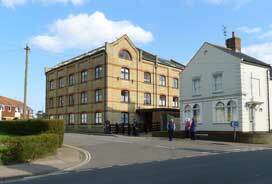 According to the unpublished memoirs of Cyril Steley, the name 'Fordux' is a back-to-front version of 'Duxford', the new Cambridgeshire RAF base where Mr F L Pallant has recently been stationed. The company goes into voluntary liquidation this year (London Gazette 7/12/1928) but, in February 1929, is reborn as a Limited Company - Fordux Mills Limited. The East Anglian newspaper reports this as a restructuring to enable expansion. An extension to the factory has been built to make mattress filling material, flock - only the second such plant in the country. The new factory will, it is reported, employ about 50 people. "The factory, a fireproof building, is of steel and asbestos construction, and embraces the most modern requirements for the health and well-being of employees. Machinery of the latest type is installed to produce materials of the very highest standard of purity. Mitive power is supplied by Messrs Crossley Bros of Manchester, by one of their new model, high-powered oil engines..." East Anglian. 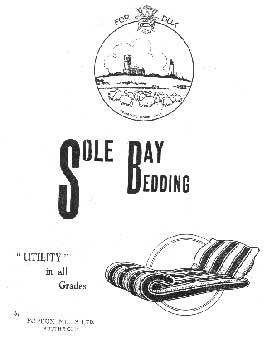 Fordux Mills (1947) Ltd - Bedding Manufacturers (CSP1953). The group posing with carts is thought to include proprietors, CR Smith and HW Girling with Henry Moss (centre) the owner of the drapery and grocery business at 25 Market Place. A Smith & Girling invoice dated 1899. 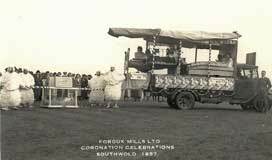 The Fordux entry in the carnival celebrating the The1937 Coronation of George V1. With thanks to Margaret Palmer for loaning us this postcard from the collection of her late son, Robert. Interior of the Fordux flock mill in 1947. 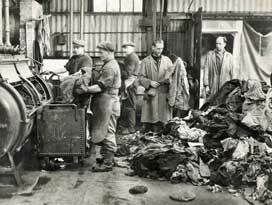 Rags being processed into flock for stuffing mattresses. Early 1950s advertisement for Fordux Ltd.